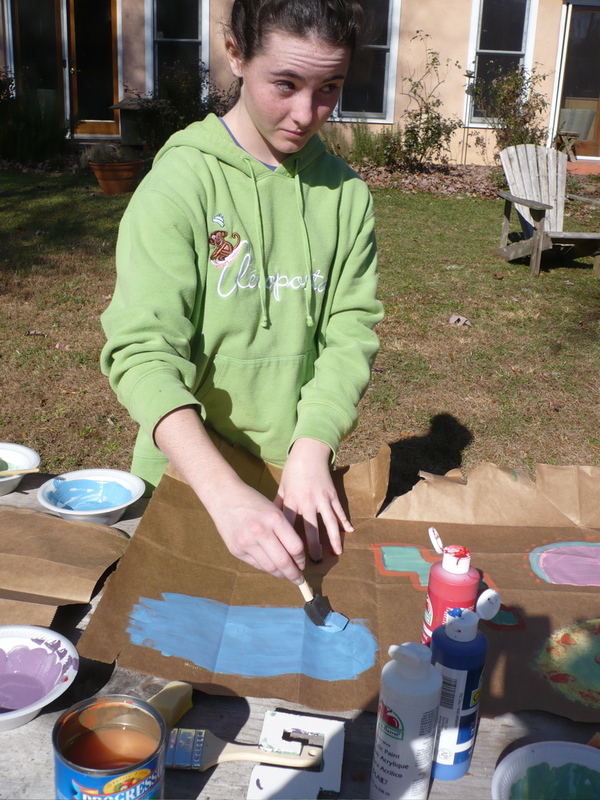 ← December 2009 Happenings! Oaxaca Textile Museum. 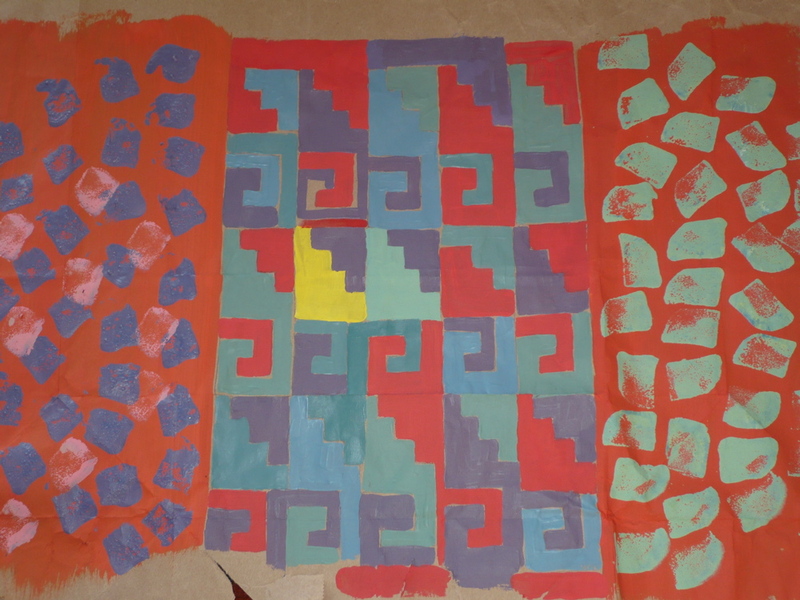 Kites, left to right: Francisco Toledo’s handmade paper kite; kite back; Eric Chavez Santiago’s Zapotec greca kite; kite back; Norma with kites. Up in the hills in San Augustin Etla, about 30 minutes north of Oaxaca city, is the paper making workshop of Francisco Toledo. Artists and apprentices first make the handmade paper, decorate the paper with Toledo designs using airbrush painting techniques, the fashion the art into fanciful kites that are sold there in the studio gallery or at IAGO on Macedonio Alcala in the historic center of Oaxaca near the Santo Domingo church. The kites are decorated with figures that Toledo is famous for: monkeys, fish, lizards, scorpions, devils, rabbits, dia de los muertos skeletal figures, bulls, cats, demons and denizens. Art historian Teresa del Conde writes that Juchitan born artist Toledo dazzles us with his inventiveness and interpretation of divine creation, the primigenital force described in Genesis, the magical qualities of composition, the sagas of old Prehispanic codices and the iconographical aspects of his work. Toledo is an artistic, social and political force in Oaxaca and works to create collaborations and brings people together to solve often difficult issues. 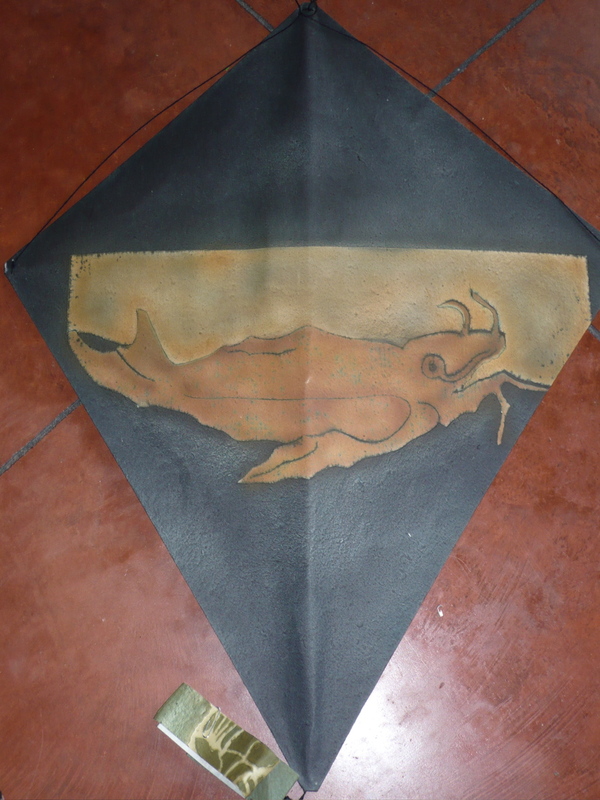 When Eric Chavez was in North Carolina in October he taught a workshop for teachers and one project was to make kites in the Toledo style and tradition. Yesterday, on Thanksgiving morning, I held a workshop for the children who were coming to dinner. I want to share this adventure with you. 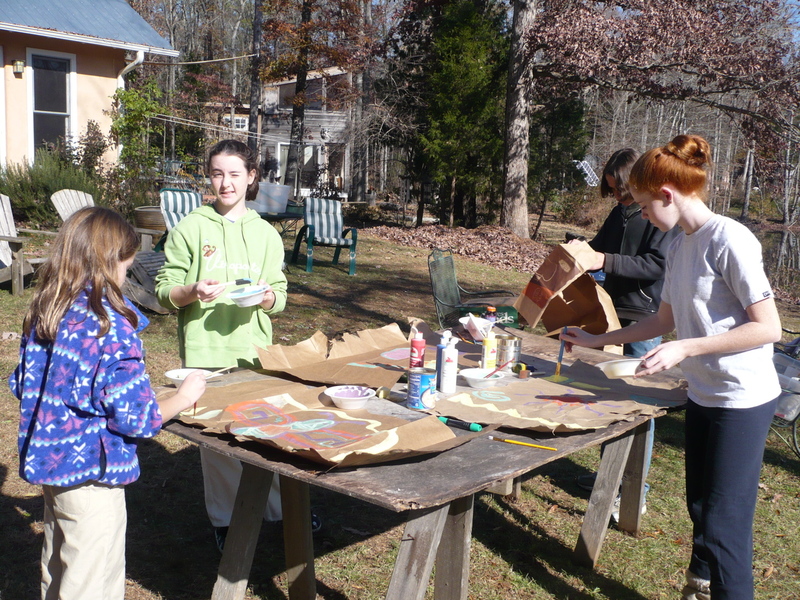 Left to right: Norma’s painted brown paper bag before it is made into a kite; Kristin, Sierra, Soren and Cassidy making kites on Thanksgiving day. 3. Bamboo for the frames and structure. You can cut apart bamboo window blinds or use bamboo stakes from a garden center. Or, use think dowel. You will need 1 piece 24″ long for the vertical bar and one piece 18″ long for the horizontal bar. 4. 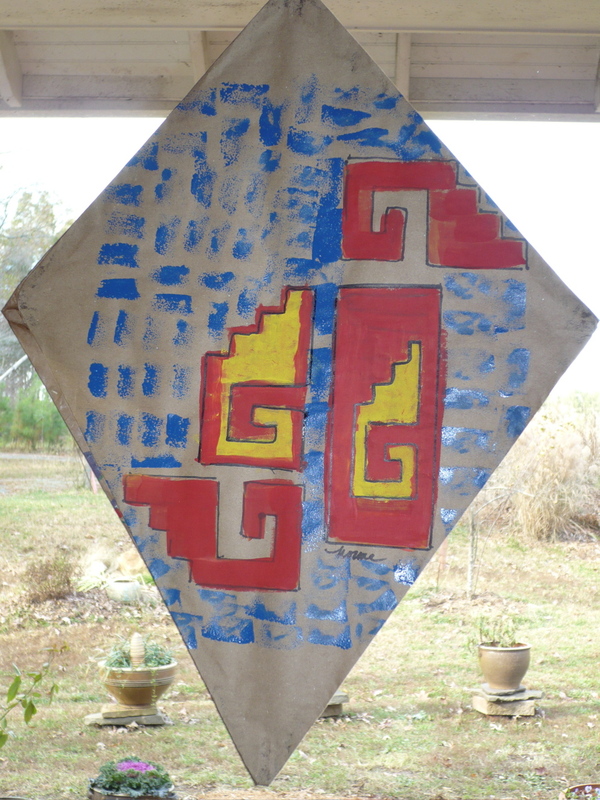 Kite decoration: acrylic paints, brushes, stenciles, sponges. 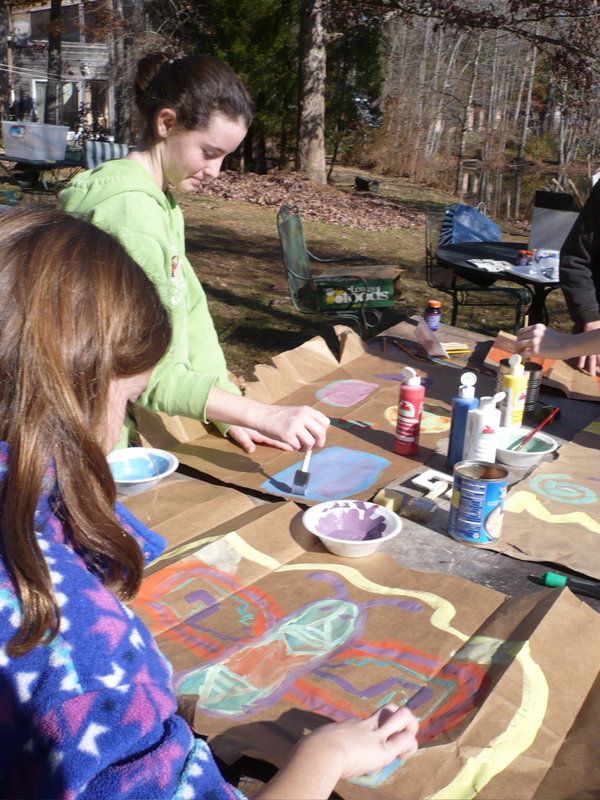 It takes us about an hour to paint and decorate the brown side of the grocery shopping bag. Let the paint dry (about 30 minutes). 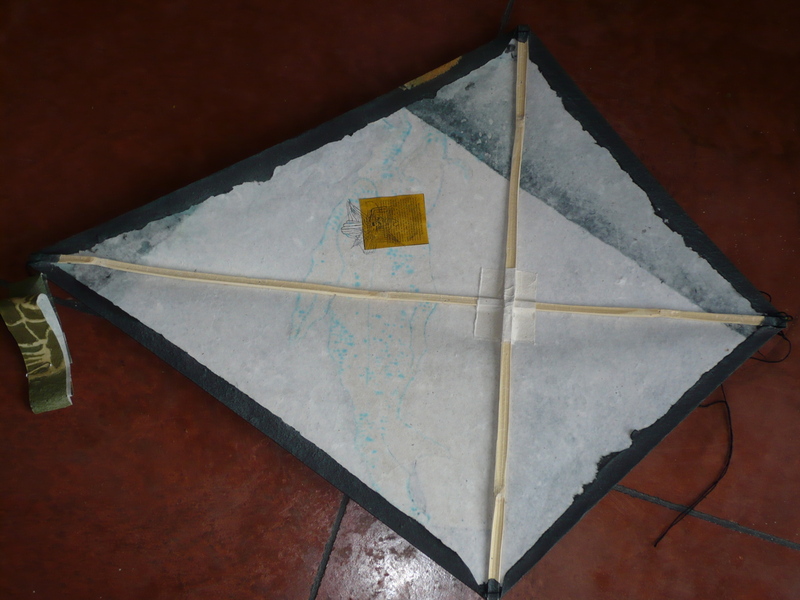 Turn the paper over and lay the sticks in a cross over the area you want for your kite (you need to check the opposite painted side to be sure the design shows where you want it to and you choose the top and the bottom). With masking tape pieces, tape the shorter 18″ stick a distance of 10″ down from the top of the 24″ stick. Tape the intersection where they meet liberally! Tape down the 4 ends of the 2 pieces. Fold the diagonal sections one at a time, making a sharp crease, so that the paper meets the cross bars. 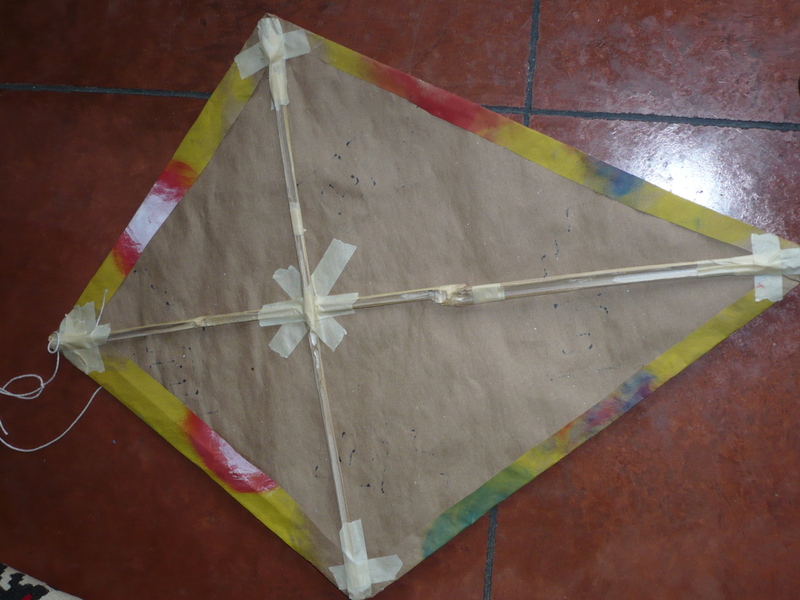 Cut 1/2″ to 1″ away from the crease, leaving an edge to overlap on the back of the kite. Do this for all four sides. 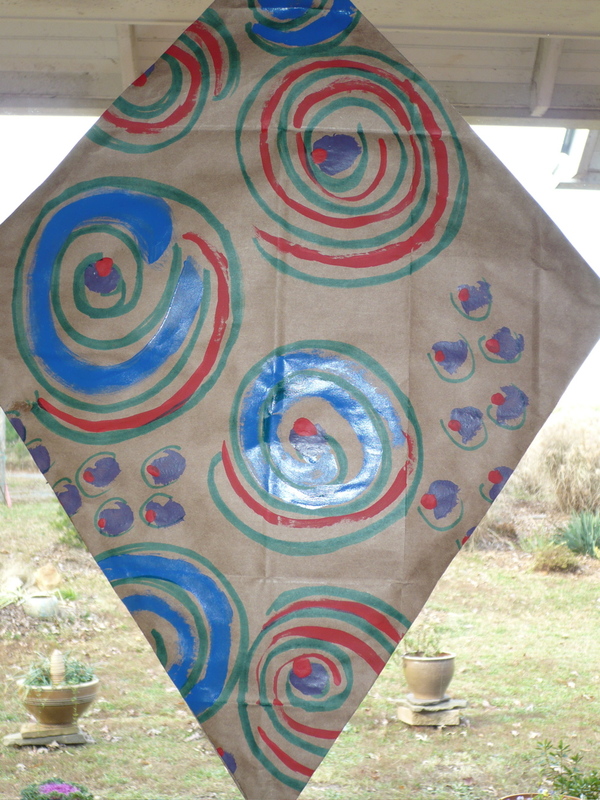 Use Elmer’s glue to paste the edges of the kite. This will take about an hour to dry. You can then tie your cotton line. 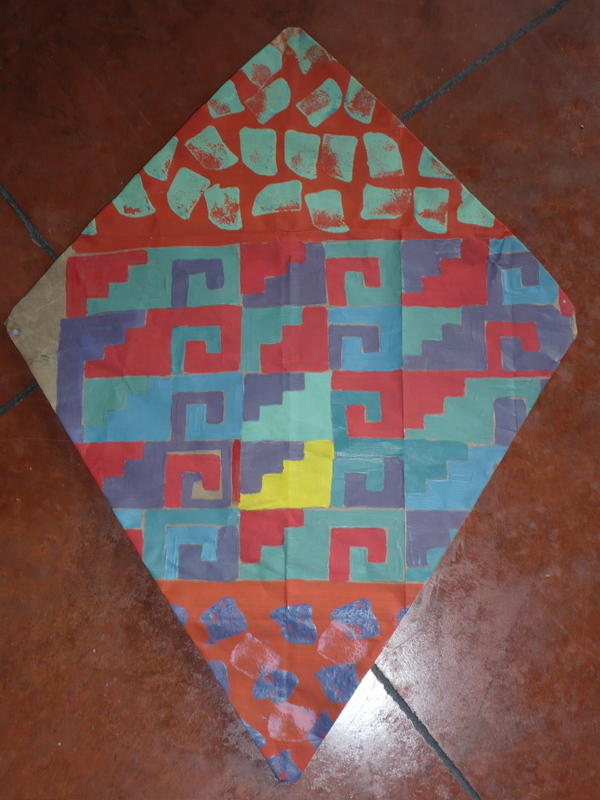 A long tail is needed to fly this kite. You can make the tail out of the bag handles! 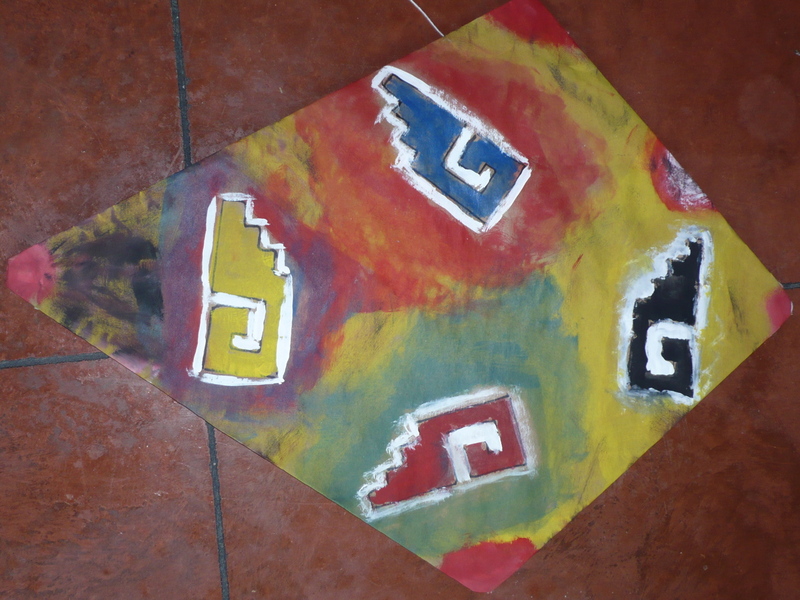 This entry was posted in Oaxaca Mexico art and culture and tagged Francisco Toledo, Francisco Toledo's kites, handmade paper, how to make a kite, kite making, Mexican patterns, Oaxaca, San Augustin Etla, Zapotec designs. Bookmark the permalink. Is there somewhere these Toledo kites are sold? Yes, in Oaxaca at IAGO, Toledo’s gallery across from the Church of Santo Domingo on Macedonio Alcala.